One common question for people new to Scrum is, "why should the length of the sprint be fixed?" What harm does it do to extend a sprint or plan the length of the sprint according to the task at hand? maintaining agility of the team (and by extension of the company). Under Scrum, we keep complexity under control by defining the parameters of each sprint. Time (calendar), Quality (through the definition of done and possibly other functional requiremens), Cost (team size * time available) and Scope for each sprint. Since Time, Cost and Quality are defined, the only thing which can vary is the amount of functionality actually produced. This is what is inspected at the end of each sprint. I like to refer to the agreement between prodoct owner and team as the "Sprint Contract". So arbitrarily changing one of the parameters violates the Sprint Contract, and this is clearly not allowed. 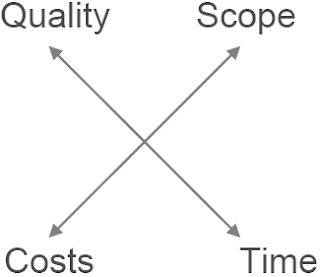 Harry Sneed's "devil's square" shows the relation between Scope, Quality, Time and Cost. And the end of each Sprint, the Product Owner inspects the progress of the team -- defined exclusively through the amount of scope produced -- and has the option of changing the course of the team. Changing any of the other parameters, say the duration of the sprint, is 1) a violation of the sprinnt contract and 2) hides from the project owner that progress is not being made as planned (or hoped). He is deprived of the chance to make a course correction. Devil's square was invented and propagated by Harry M. Sneed in his books on Software Project Calculation. I think Sneed's square is a major improvement over the 'Iron Triangle', which ignores Quality, or at best considers it floating in the air and somehow not related to the other parameters. Oddly enough, time money invested in quality (in the form of, say, automated unit tests) reduces the cost and increases the performance. But you need a to take a view which is longer than a sprint or two.